Many believe the 1992-93 NHL season was among the finest staged in the League's history. From the addition of two teams through expansion, to the sudden prominence of European players, to the heroics of Pittsburgh's Mario Lemieux, to the crowning of Montreal as Stanley Cup champions, the season was full of memorable moments. On its 20th anniversary, NHL.com will spend the year looking back at the key moments of that '92-93 season to see if it may indeed be the NHL's Greatest Season. In an NHL career that spanned 20 years, Jeremy Roenick played in nine All-Star Games, scored more than 500 goals, registered more than 1,200 points, won an Olympic silver medal and established himself as one of the most colorful characters in hockey history. But for many of his biggest fans, JR's greatest achievements did not take place on an actual sheet of ice. That's because the 2010 inductee into the United States Hockey Hall of Fame is also one of the most dominating video-game characters of all time, thanks mostly to the skills demonstrated by his avatar in EA Sports' NHL '94. The classic game was released 20 years ago this month and introduced countless people to hockey through their Nintendo and Sega consoles. It also helped make Roenick a star. "It's the No. 1 comment that is made to me over the course of every day, whether it's over Twitter or meeting on the street. Whatever the case may be, I would say one out of three people I meet mention '94 Sega," Roenick told NHL.com. "They say one of three things: One, 'You couldn't beat the Chicago Blackhawks [in the game] because of Jeremy Roenick.' No. 2, 'I got through college playing Jeremy Roenick in '94 Sega.' The third is it was a rule that you couldn't be the Chicago Blackhawks in the game, because they were that unstoppable. "That still happens almost daily." NHL '94 is remembered primarily for Roenick's virtual exploits, not to mention a legendary scene in the 1996 movie "Swingers," although the film's characters actually played the predecessor, NHLPA Hockey '93. That also was a revolutionary game that earned its place in history. After the previous year's iteration from Electronic Arts included an NHLPA license but no NHL team licenses, NHL '94 was the first hockey title to include entire player rosters as well as all NHL team names and logos. The innovations didn't end there. "They wanted some hockey realism. I had this list of features they wanted to add to the series," said Mark Lesser, the lead developer for the game who previously worked on EA's Madden NFL series and by his own admission didn't know a thing about hockey. "Goalie control was one of them. They wanted a shootout game in it. They wanted the replay improved. They wanted flip passes and one-timers. They wanted improvements in the music. It goes on and on. "I liked the fighting in [NHLPA] '93 and we removed the blood. The NHLPA, as I recall, required us to remove the blood." Twenty years later, EA's NHL franchise remains one of the best-selling sports video games in the world. With every passing year, the game becomes more intricate and lifelike, thanks in large part to EA's team of developers and designers. But it all started with one developer working in a barn in Maine. "In those days, there weren't big production teams. There was a sole programmer, me, and a graphics guy who I hired," said Lesser, who spent hours trying to perfect the accuracy of one-timed shots in the game. "Then EA supplied a sound guy to digitize the organ music. In fact, most of the work on that game was done in a barn in Brooklin, Maine. Around 2:30 in the morning, I was playing and hit the one-timer button and it was a perfect one-timer. 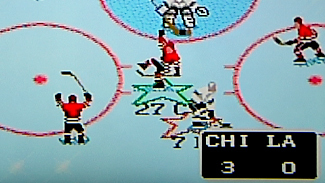 When I forget everything else about NHL '94, I'll remember that moment. It was a moment of real joy." From the day it was released, NHL '94 was a hit. It allowed gamers everywhere to play out their favorite rivalries and changed the way many people viewed both hockey and video games. "NHL '94 was about that couch experience where we battled," said Sean Ramjagsingh, EA's current lead producer for the NHL franchise. "I was in university at the time, so we used to battle for everything, whether it was cleaning the bathroom or cooking dinner or washing dishes. NHL '94 was the decider in who had to do those chores. "It's one of the first games that I played religiously. I always wanted to be a part of hockey. NHL '94 was the game that put video games on the road map for me and turned it into a career." Though the Nintendo and Sega consoles are now considered primitive technology, there are several gamers who continue to play NHL '94 online through web emulators. In November 2010, the Kamloops Blazers celebrated their Western Hockey League win over the Regina Pats by mimicking the robotic movements of the NHL '94 avatars. It was a tribute to the game that came out when most of the players were 1 year old. In fact, practically everyone associated with the game has become a cult figure of sorts, including Ron Barr, the longtime sportscaster who served as its pregame host. "I was on an airplane once and a flight attendant comes up to me and said there were a couple of kids who said they thought they knew who I was. They were about 10 years old and one of them told me, 'You're the dude in the hockey game.' Even now, kids will recognize me," Barr told NHL.com. "I didn't expect that type of recognition and exposure, but I'm really proud of it. It's a pop culture thing. You ask anybody about the first video game they remember, they're going to say NHL '94." The game even struck a chord with hockey dilettantes. Gal Lavid, a Rutgers University graduate, in college became so enamored with the game he adopted the Blackhawks as his team. By the time he began dominating the game in local competitions, he went so far as to get a Blackhawks tattoo. "It was definitely a gateway for the NHL for me. I always had a cursory interest in it, but didn't have that kind of passion for it," Lavid said. "After Sega came out, I had a Blackhawks poster in my dorm room because of the game." Like 40-year-old Lavid, most gamers associate the title closely with Roenick, who became a breakout player in a game that included names like Gretzky, Roy, Lemieux, Yzerman and Bourque. And for the man who was named history's fourth-greatest video game athlete by gaming website IGN.com -- behind Michael Vick, Bo Jackson and Mike Tyson -- it's a legacy he is happy to embrace. "It's one of my claims to fame," Roenick said. "I'm very proud of it. I'm down in the annals of history, whether it's being on the ice or in video games. I like that aspect. Whoever it was at EA who gave me the [great] rating in '94, you've left me something to be proud of for eternity."